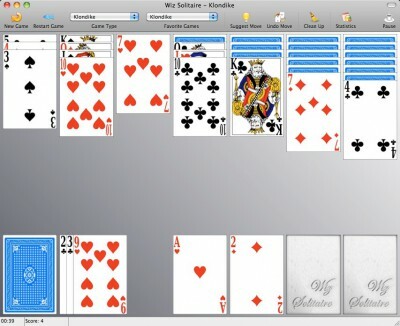 Wiz Solitaire 1.28 is card software developed by Simone Tellini. Wiz Solitaire is a collection of more than 20 classic card games (Klondike, FreeCell, Spider...) with the possibility to create and use beautiful decks with your favorite pictures. Wiz Solitaire supports different deck formats allowing you to choose between thousands of available card sets. You can also easily create your own decks with the included Deck Editor. This games & entertainment software is shareware, which means you can download and use Wiz Solitaire 1.28 for free during the trial period (usually for 30 days). At the expiration of the period you will have to buy the card product for $19.00. Wiz Solitaire 1.28 is available at regnow and Simone Tellini website. Wiz Solitaire 1.28 supports different languages (including English). It works with Mac. We have tested Wiz Solitaire 1.28 for spyware and adware modules. The software is absolutely safe to install. Our website has thoroughly tested games & entertainment product Wiz Solitaire 1.28, written the review and uploaded installation file (2422K) to our fast server. Downloading Wiz Solitaire 1.28 will take minute if you use fast ADSL connection. mondo solitaire - Play solitaire! Choose from over two dozen different forms of solitaire and variations (both one and two deck games), including Klondike, Canfield, Golf, FreeCell, Spider.